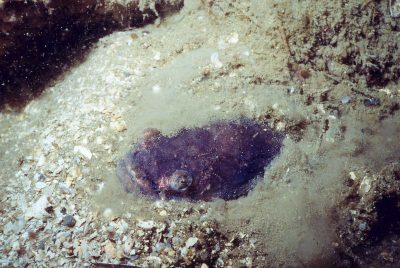 Male plainfin midshipman (Porichthys notatus) excavate den-like nests (above) and produce a loud, droning hum during mating season. Photo by Janna Nichols, www.pnwscuba.com. For years, houseboat residents in Sausalito, CA, complained about a droning hum from San Francisco Bay on summer nights. The sound was so loud that it could drown out conversations and/or disrupt sleep. Theories for the mysterious sound included sewage pumps, military experiments, and submarines. Researchers found the noise to be caused by vocalizing, male plainfin midshipman (Porichthys notatus). Midshipman fishes belong to the same Family as toadfishes, Batrachoididae. They are distinguished by having photophores, light emitting organs that are used to attract prey. These photphores look like the buttons on a naval officer’s uniform, hence their name, midshipman. There are approximately 15 species of midshipman fishes. Plainfin midshipman range in distribution from intertidal areas to deeper waters in the Eastern Pacific Ocean. They feed on crustaceans and other fishes. Mating in the plainfin midshipman depends on acoustic communication. During the breeding season, courting males produce advertisement calls, or hums, at night to attract females and encourage them to lay eggs in the males’ nests. 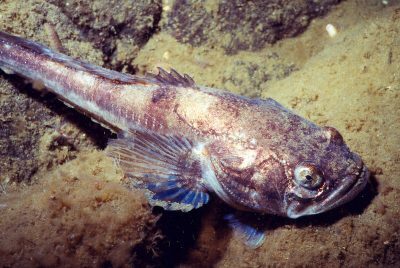 The hum is a low-pitched sound generated by the rapid contraction of the drumming muscles on the male’s swim bladder. All of the humming males together sound like a huge hive of bees or a group of motorboats, a sound loud enough to be heard by people on nearby land and houseboats. Reproductive females respond to the humming by choosing a singing male’s nest and depositing all of their eggs for that season in that nest. Hoping to lure more females to the nest, the male resumes singing after a female’s departure. He also actively guards his nest until the offspring hatch and mature. He will hum until his nest is full of multiple clutches of eggs. A single male may fertilize and guard as many as 1,300 eggs. Midshipman are distinguished by having photophores, light emitting organs that are used to attract prey. These photphores look like the buttons on a naval officer’s uniform, hence their name, midshipman. Photo by Janna Nichols, www.pnwscuba.com. Only some male midshipman can hum. These are called Type I, or parental, males. These fish excavate den-like nests beneath rocks in the intertidal zone, guard their nests, and hum to attract females. Type II or “sneaker” males are smaller than Type I males, do not build nests, and cannot sing. Unable to attract females because they cannot sing, sneaker males hang around the nests of humming Type I males and quickly dart into this other male’s nest when a female enters, and fertilize her eggs. In addition to hums, Type I male plainfin midshipman produce two other types of vocalizations. The first is a series of grunts that scientists have termed a “grunt train.” The rapid succession of brief signals is produced at intervals of about 400 msec. These signals are believed to function as a sign of aggression when other males challenge an egg-guarding Type I male. The second type of vocalization is a low growl, which is usually heard at the beginning of the breeding season when Type I males are establishing their nests and are highly aggressive and territorial. Interestingly, researchers have found that plainfin midshipman can regulate their hearing so that they are not deafened by their own humming and can hear other animals while vocalizing. One region of the fish’s brain controls both hearing and sound production. Some nerve impulses stimulate the muscles around the swim bladder to contract, causing sound generation. Other impulses inhibit the sensitivity of the hair cells in the ear. Both sets of signals are perfectly synchronized so that the bladder vibrates at the exact same time as the ears’ sensitivity is reduced. How do fish produce sound?